The Bible rightfully assumes to be God's message to man. The books of the world assume to be no more than man's message to his fellow-man. The Bible therefore deals with things eternal, infinite, and otherwise unknowable as freely as other books deal with things temporal, finite, and known. In forming the Scriptures, it is true that God employed human writers, but these men, though they may have understood but little of the whole to which they were contributing, did nevertheless, under the mighty hand of God, produce a single Book in which there is infinite continuity and which manifests every evidence of being the work of one Writer who alone is its Author. The true doctrine of inspiration contends that God so directed the human authors that, without destroying their own individuality, literary style, or personal interest, His complete and connected thought toward man was recorded. Various opinions have been advanced as to the extent of the divine control over the human authors. These have been called "theories of inspiration," and all students of the Bible should be clear in their own minds with regard to these vital issues. 1. Naturalistic. -- This, as the name implies, is the theory that the Bible is only a human product and therefore void of any supernatural elements. This view, which discredits and degrades the Word of God, is held only by infidels and unregenerate men. 2. Partial. -- By this term a theory of inspiration is indicated which suggests that only certain parts of the Scriptures, are inspired. When this theory is accepted, of necessity each person is left to determine for himself what portions of the Bible are inspired and what are not. All authority is broken down since people are not naturally inclined to receive and apply to themselves those words of reproof and correction which are contrary to their own wishes. Those who hold this theory usually make much of the words of Christ as being more authoritative than other portions of the Scriptures; disregarding the fact that Christ wrote nothing and that His words are, at best, the report of the very men whose writings they, in other connections, discredit. However, it should be remembered that Christ declared His own acceptance of every word of the Old Testament to be the Word of God, and that He provided for the full authority of every word of the New Testament. 3. Gracious. -- This theory of inspiration suggests that the writers of the Bible were inspired in the same way, though to a fuller degree, as Spirit-filled men are empowered today. The writings of the Apostle Paul are said to be comparable with the writings of John Calvin or Martin Luther, and equally liable to be marred by human error. This and the "Partial" theory of inspiration are the theories which are held by Modernists today. 4. Verbal. 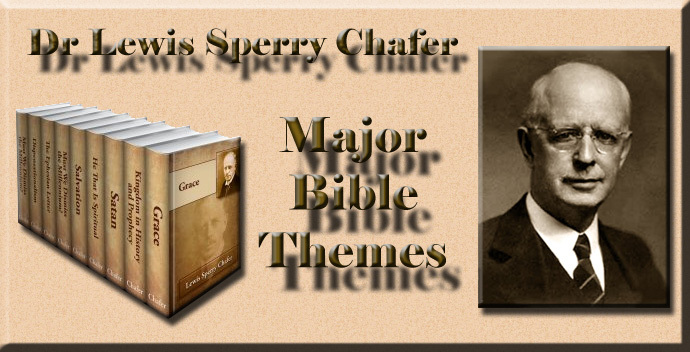 -- This theory, as its designation implies, maintains that the Bible is, even to its very words, an inspired book. This claim is made for the original writings only and not for copies, translations, or quotations, even though they may date back to the early days of the Christian era. However, though no original manuscripts are now in existence, it is important to observe that the most careful study of those copies, translations and quotations which are available yields clear evidence that our present text of the Bible is a very close reproduction of the original. It is sometimes claimed that it was not the very words but the thought, or concept, which was inspired. The sufficient answer to this suggestion is that, apart from the, exact words, there could be no precision in a mere conception, particularly such precision as is demanded in the Scriptures. So, also, the declaration of the writers who knew the facts is that they were responsible for words rather than the mere concept (note Moses, Exo 34:27; David, 2Sa 23:2; Psa 45:1; Solomon, Pro 30:6; Isaiah, Isa 6:5-8; Jeremiah, Jer 1:7; Jer 36:1-2; Zechariah, Zec 7:7, Christ, Mat 8:17; Joh 14:10; Joh 8:47-48; Joh 17:8; Paul, 1Co 2:4; Jude, Jud 1:17-18: R.V.) Nor does the Bible's own claim to be inspired, even in its very words, limit the choice of words or the flow of style on the part of the human writers, for God is abundantly able to secure the exact expression He demands even within the literary limitations of a fisherman. Beyond its own claims, the Old Testament was declared by Christ to be the inspired Word of God. When He spoke, none of the New Testament had been written, therefore He could have referred only to the Old Testament (Joh 17:17). Likewise, the New Testament was written according to His provision and promise. He had said that He would leave a revelation and that it would be completed after His departure (Joh 16:12-13). This revelation was committed to Certain men (Joh 15:27; Act 1:8; Mat 28:19; Luk 10:22), and He gave their words the same authority as His own (Mat 10:14-15; Luk 10:16; Joh 13:20; Joh 17:14, Joh 17:18; Heb 2:3-4). 1. "All scripture is given by inspiration of God" (2Ti 3:16). The word which is here translated inspiration is used but once in the New Testament. It means "God-breathed," and, according to this verse, this divine element extends to all the Scriptures. 2. "Holy men of God spake as they were moved by the Holy Ghost." (2Pe 1:21). The phrase, "moved by the Holy Ghost," is the vital element in this revelation and its literal meaning is that the writers were "borne along" by the Spirit of God. Such is the Bible's own claim to inspiration. 1. Inspiration provides that the exact divine message be given. If it is God's Truth which is reported, it is recorded exactly. If it is Satan's lie, it is presented as a lie, for inspiration does not change a lie into truth. If it is history, it is true to the facts. If it is prophecy, it indicates precisely what will come to pass. 2. Inspiration aims at inspired writings and not at inspired men. The very infallible Scriptures themselves record the sins and failures of the human authors. 3. Since we depend upon the Bible alone for the knowledge of the most vital facts of our existence, there is every reason to contend for the divine accuracy of God's Word and to be grateful that it is "God-breathed" and therefore not merely as fallible as its human writers, but is as infallible as its divine Author. 1. Wherein does the Bible assume to be God's message to man? 2. For what does the doctrine of Inspiration contend? 3. Define the Naturalistic Theory of Inspiration. 4. Define the Partial Theory of Inspiration. 5. Define the Gracious Theory of Inspiration. 6. Define the Verbal Theory of Inspiration. 7. Which of these do you accept? 8. Why is it that inspiration cannot be limited to the thought or concept? 9. What theory of inspiration does the Bible claim for itself? 10. Indicate Christ's attitude toward the inspiration of the Old Testament Scriptures. 11. What provision did He make for the inspiration of the New Testament? 12. State the meaning of the word inspiration as used in 2Ti 3:16 and of the words moved by the Holy Ghost as used in 2Pe 1:21. 13. Indicate the effect of inspiration on the recorded words of God, of Satan, of men, of history, and of prophecy. 14. Does inspiration aim at inspired men or inspired writings? What proof can be given for your answer?